'Iris 'Florentina'' is an early flowering iris of historical significance and its shorter growth suits the front of the border.The variety was mentioned in the post on 'Gracchus' as a cut flower. Also known as the Florentine Iris, 'Florentina' is in my opinion a natural hybrid that has found favor with gardeners for at least the last 600 years. Used in the production of Orris Root along with I.albicans, I.pallida, and I.germanica. The following will give much for the reader to consider. 93. I. florentina, Linnaeus Species Plantarum edition 2, p. 55; Botanical Magazine., t. 671 ; Redoute Les Liliacées., t. 23; John Sibthorp, Florae Græcae., t. 39; Reichenbach, Iconographia Flora Germanica., tab. 339, fig, 766; Woodville, Medical Botany. iv.. t. 263, 1790-93 ; Spach, Histoire naturelle des végétaux xiii.,p. 63 ; Bentley and Trimen, Medicinal Plants, t. 273 1875; I. alba, Gaetano Savi, Flora Pisana vol. i., p. 32. Rhizome wide-creeping, thicker than a man's finger, fragrant when dried. Leaves about half-a-dozen in a tuft, ensiform, glaucous, 12— 13 inches long, 1—1½ inch broad, narrowed gradually to a point. Flowering stems 2—3 feet high, much overtopping the leaves, branched above the middle, bearing 3—4 terminal spathes. Spathe-valves 2—2½ inches long, lanceolate-navicular, 1—1¼ inch broad, green on the keel in the lower part only at the flowering time, tinged with purple towards the edge. Flowers fragrant. 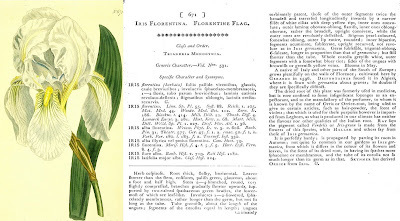 Pedicel ½—¾ inch long inside the spathe; ovary cylindrical, ¾ inch long; tube 1 inch long, greenish; limb 3—3½ inches deep; both rows of segments 18—21 lines broad; falls obovate-cuneate, white tinged with lavender, reflexing half way down, the claw veined with green and brown, the beard bright yellow; standards erect, obovate-oblong with a short claw, pure white. Standards 1¼ inch long, exclusive of the deltoid toothed crests. Anthers ⅝ inch long, equalling the filaments. Now spread universally through the Mediterranean region, but it has been cultivated so much that its indigenous distribution is quite uncertain. It is one of the best known of all the Irises flowering in our London gardens with germanica early in May. Colour effect somewhat grayed bluish white self: good size: form long to oblong spreading: tall bearded class; height 27in ; branching widely fastigiate, below center, 2-3 laterals. A flower of medium good substance; frail to firm texture; very good fragrance; poor to good lasting quality. Useful in mass, where it is persistent foliage is good after the flowering season is over. Useful also as a cut flower. S. opalescent blusish white to pearl and pale olive gray; carriage cupped, arching, floppy; blade spatulate to wedge shaped, waved; a few hairs often present on claw; 1½ in. wide, 2¼ in. long. F. pearl to bluish white,cream-colored on haft with indistinct reticulations of olive; carriage dropping; shape spatulate to wedge-shaped; waved; size 1½ in. wide, 2½ in. long. Minor parts; beard fine to coarse, dense projecting, conspicuous, white tipped with yellow; haft broad, channelled; reticulations broken, widely spaced, inconspicuous; style-branches broad, overarching, keeled, bluish; crest large, fringed; pollen plentiful, yellow; spathe-valves scarious, inflated,keeled. Growth vigorous; increase rapid; habit compact; foliage stiff, leaves broad, glaucous yellow-green; 2 blooms open at once, floriferous; stalk erect, with 5 buds. This is a sweet scented, early flowering variety and together with I.pallida is the source of the dried orris root of commerce. According to the best botanical usage I.florentina is not a proper designation of any species of the bearded iris. This should more properly be treated as a horticultural variety of I.germanica. As such many synonyms have occurred, perhaps due to slight variations within the strain or to local conditions affecting color, size, or shape of blooms. Some of these names are; alba odorata; Florentina Alba: Florentina Queen Emma; Florentina Silver King; Gambetta; Florentine. For a variety so well adapted to general mass planting and so useful as a cut flower, its rating (76) would seem much to low for an iris of its quality, produced early in the season. Atti Del 1 Simposio Internazionale Dell'iris - Firenze, 14-18 Maggio 1963. Includes a paper by Dr Luigi Sani asks us to consider that at one time I.albicans was used for orris root production and it was sometimes mistakenly called I.florentina. It is the iris I.pallida which is mainly grown for this purpose in Tuscany. I.germanica 'Florentina' (Syn. I.florentina L.) This is the white flowered variant of I.germanica which is frequently confused with I.albicans . 'Florentina' has beautiful, scented, flowers of a very faintly bluish shade rather than pure white and on the falls there is some greenish-yellow veining on the haft, and a deep yellow beard. Like I.germanica the inflorescence is branched and these branches are quite long, immediately distinguishing it from I.albicans in which the lateral flowers are sessile. FLORENTINA TB-W1 (Collected-Italy-Introduced Northern Europe, about 1500) The name florentina has been applied to various forms of Iris. 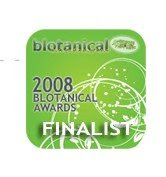 According to the best botanical usage it is not a proper designation of any species of the genus. It is therefore treated here, as also in Bailey's Standard Cyclopaedia as a horticultural variety of I.germanica which together with I.pallida is the source of the aromatic "orris root"of commerce. The name I.florentina is often mis-applied also to I.albicans. Reproduction in whole or in part of this post, its opinions or its images without the expressed written permission of Terry Johnson is strictly prohibited. Tall Bearded Iris "BENTON OLIVE"
Tall Bearded Iris "BENTON OBERON "
Tall Bearded Iris "WHOLE CLOTH"
New Zealand Tall Bearded Iris "POLYNESIA "
Tall Bearded Iris "ABBEY ROAD"
Tall Bearded Historic Iris "GRACCHUS "